Tottenham Hotspur had a bit of a tumultuous summer centered almost entirely around one individual: Luka Modric. The wantaway midfielder carried a hefty price tag and was courted by several large clubs, and an eventual move to Chelsea seemed all but signed. But Tottenham managed to hang onto their linchpin, though it didn't play out as smoothly as they would have liked. Modric officially requested a trade and held himself out of two early matches, exposing more behind-the-scenes issues for the club. The riots in London postponed their opening match against Everton, and Spurs didn't officially open up the season until the following week against the Champions, Manchester United. Spurs showed, most importantly, their lack of creativity on the ball without their star middle man and was promptly dispatched with a 3-0 defeat. Three days later they attempted to pick things up with a Europa League clash against Heart of Midlothian. Though they played an admittedly youthful 11, they again failed to get on the score sheet in a 0-0 draw. Then came Manchester City. There was a small, very small bright side to their 5-1 trouncing by the league leaders.. they did at least get on the score sheet. Edin Dzeko couldn't help but score four goals in the affair, and another was poked in by Kun Aguero. Kaboul managed Spurs' only goal, and Tottenham went back into the locker room with zero points in two matches. But then things started to pick up. Spurs didn't lose a match in any competition for the next two months, and lost in the league for the first time in 12 matches last Sunday at Stoke City. Stoke was a bit of a letdown, sure, but in their 11 match unbeaten run they managed a 4-0 thrashing of Liverpool and a 2-1 victory over their most hated rival, Arsenal. So what changed? Well, for one thing, Luka Modric stopped whining and started playing - and started playing well. Gareth Bale has continued his stellar form of last year, wreaking havoc down the left flank. The early season injury woes of Rafael van der Vaart (who also seemed a bit unsettled at the club during the Luka fiasco) have subsided. He's slowly begun to regain the magic that helped Spurs remain relevant as a top(ish)-tier club last campaign. 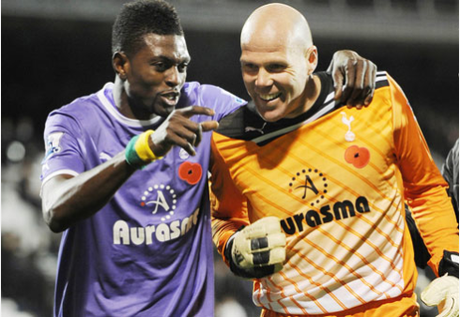 Oh yeah, and then there was the loan of Emmanuel Adebayor. The one thing Tottenham was absolutely missing was a top-notch poacher up front. Adebayor has netted seven times in 11 matches for the club, who will undoubtedly be looking to secure a permanent move for their Togolese hit man. A Tottenham starting 11 of Adebayor, Modric, van der Vaart, Aaron Lennon, and Gareth Bale in attack, Scott Parker solid and wholly reliable in possession, the capable defending of Kyle Walker, Benoit Assou-Ekotto, William Gallas, and Younes Kaboul, and the consistent keeping of Brad Friedel is as strong of a lineup as you'll find in the league (save for the two Manchesters). If they can stay healthy, harness their talent, and play consistent football, they can certainly upset the status quo around the top of the table. In an admittedly down year, with Liverpool, Chelsea, and Arsenal struggling to find their groove, Tottenham is in a position to qualify for their second Champion's League berth in three years, and if they're not careful may find themselves challenging the city of Manchester for the League's top spot come year end.